Your roof might not need to be replaced. It might just need to be cleaned. If you're not sure, call (704) 251-7747 to speak to a Excel Pro Service LLC roof cleaning specialist. Excel Pro Service LLC cleans all types of roofs, including residential shingle roofs, and commercial metal and copper roofs. We've been in the roof cleaning business since 2008. Do you need your roof cleaned? If you have black stains on your roof, it's not just because it's dirty. Roof staining is actually caused by algae growing on your roofing shingles. The climate in North Carolina is extremely favorable for the growth of algae. Excel Pro Service LLC gets rid of roof algae, moss, mold, lichen, and fungus. We've been in the roof cleaning business for 11 years. With our soft washing technology, Excel Pro Service LLC uses environmentally safe solutions to clean your roof and get rid of mold. Most jobs can be completed in one day. Protect your family and your house. Many types of algae, lichen, and bacteria feed off of organic material like limestone, commonly found in roof shingles. Algae growth causes an acceleration of roof shingle deterioration. Once your roof shingles begin to deteriorate, decreasing the lifespan of your roof. Don't let that happen! 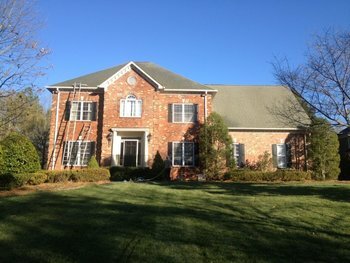 Call (704) 251-7747 to find out how easily and quickly Excel Pro Service LLC can clean your roof. Save money by having your roof cleaned. Excel Pro Service LLC roof cleaning services are performed by trained technicians, using professional grade equipment and cleaners that are specifically designed for cleaning roofs. We use a low pressure, soft washing process that is environmentally safe to ensure that your shingles are not damaged during the cleaning process. Regular roof cleaning will increase the lifespan of your roof. Moss or algae-covered roof shingles absorb heat, which will increase the temperature of your attic and increase your energy bill. Black stains or unsightly growth on your roof will have a negative impact on the value of your home. Keep thousands of pounds of roof shingles out of landfills. Make your roof look new again. Make your roof last longer! Call (704) 251-7747 today.